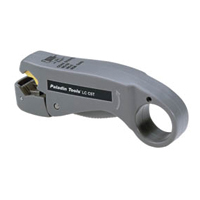 2- & 3-level stripper for small diameter coaxial cables including: RG178, RG179, RG188, AT&T 735(A), NT735, Belden 1855A, 8218, LMR 100A, RG180, RG187, RG188A, RG405 & more. 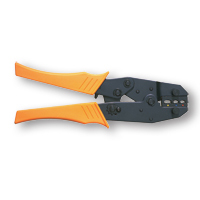 - Pre-set strip lengths: outer jacket = .344" and inner dielectric = .094"
The original interchangeable-die crimping system - all the rest are mere copies of the Paladin innovation. 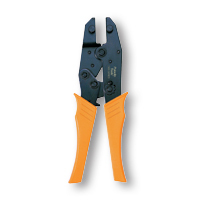 It continues to be the answer for precision-crimping at an affordable price with 5 die sets available. 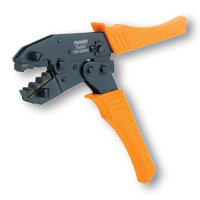 Crimps 22-10 AWG (.34-6 MM²)insulated terminals & lugs. Crimps 22-10 AWG (.34-2.5 mm²) open barrel, narrow, non-insulated terminals and lugs for standard commercial terminals. Crimps 3-piece BNC/TNC coaxial connectors. Crimps N-type, MS39012 Type coaxial connectors. 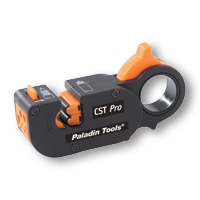 Paladin Tools PA1328 1300 Series Crimper CATV "F"
Crimps CATV "F" coaxial connectors for video. 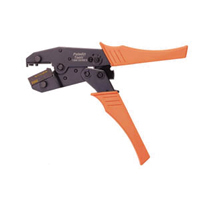 Crimps SRF and SMF fiber optic connectors. Crimps Thinnet, BNT/TNC & Mini-UHF 50 & 75 ohm coxial connectors. Crimps BNC/TNC & mini-UHF 50 & 75 ohm coaxial connectors. Crimps BNC & TNC coaxial connectors.